One of the more difficult things about eating real food is grocery shopping. Grocery stores are designed to make people buy prepackaged, GMO'ed, artificial and preservative full foods. Even places like Whole Foods can be tricky. The are a couple of ways to go to the market without filling your cart full of crap. Just avoid boxed food and your good to go. Most of the time. One of the many perks to places like Whole Foods is their ready made options. The pre made foods look delicious, smell wonderful and should be healthy, right? Not so fast...take the time to look at the ingredients listed and you'll soon realize that even though they appear healthy, the reality is that cheap ingredients are usually used. Once in a while though, you'll find something that tastes good and is good for you. They have this detox salad that I love. Easy and quick. 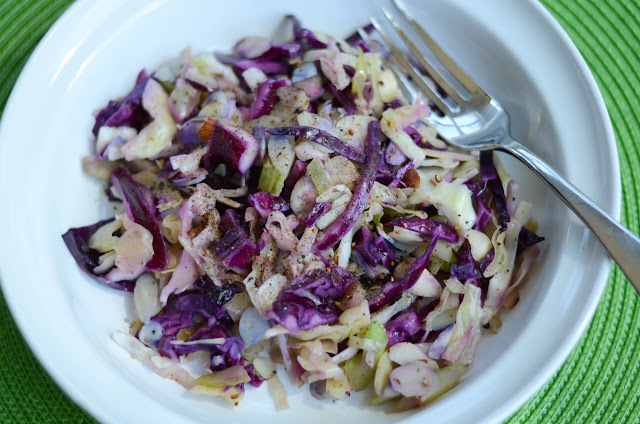 Another one is the cabbage salad...unfortunately it is made with canola oil so I knew I had to adapt it at home. And quite frankly, my version is better tasting...and better for you. Mix celery, cabbage and almonds together in large bowl. In a small bowl, mix oil, vinegar and mustard until cohesive. Salt and pepper to taste. This might taste a little tangy to you, but trust me, it works well with the cabbage. Fold the mixed dressing into the cabbage. Cover the bowl and allow flavors to marinate in the fridge, stirring about every hour, for at least four hours. Salt and pepper to taste when serving.